On a bitterly cold winter’s night what better way to warm the soul than to have a rib sticking meal in a neighbourhood brasserie in 14th arrondissement. This is exactly what I did on my second foray of solo eating in Paris. From a swift read of the menu blackboard on the pavement, and I mean swift, it was -2 and snowing that night. I was enticed in by a modern take on a French brasserie. As I opened the door and pushed past the heavy red velvet curtains, providing a welcomed barrier to the harsh elements outside, I was greeted by a waitress whose smile lit up the room. I told her I wanted a table for one for dinner which didn’t seem to faze her. She gave me a choice of two tables. Neither table was hidden away and I chose one facing the rest of the restaurant. 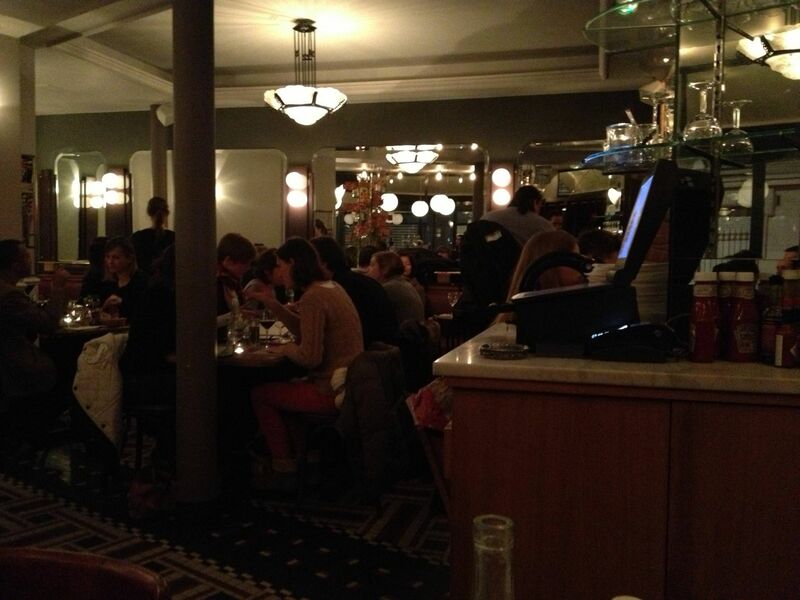 There was certainly a buzz in the air in the brasserie with all but one of the tables empty in the brasserie. Those who had just stopped in for a drink were sitting at the impressive zinc bar which takes pride of place. Even though the place has had a modern refurbishment the original art deco globe lightings and clock are still given pride of place. The small touch of placing tealights on every table just adds to the cosy atmosphere. Both English and French can be heard. Although the tables are close together they are just far enough apart that not every word of the conversation from the adjoining table is audible, but if you did want to join in their conversation you could. And so to food, everything looked so good and I was tempted by the steak but it wasn’t served with frites. I had in my mind wanted steak frites. My eyes fell upon ‘steak tartare a notre facon”. I had to know what it was. The waitress smiled and suggested I try it. Given the cold outside I asked for it to be flashed on both sides in a pan. 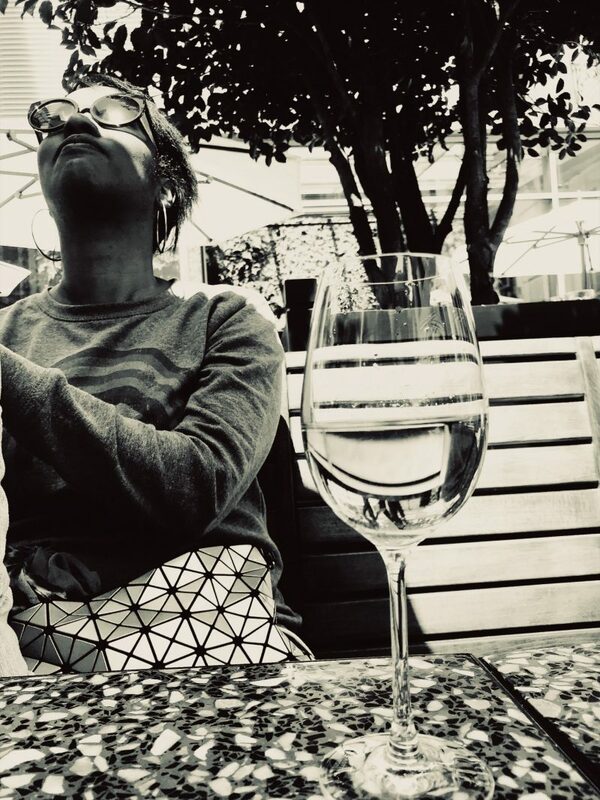 Whilst waiting I looked at the short but complete wine list and chose a glass of Languedoc (€4,50) I wanted to taste a little sunshine even if if summer was still months away. Before my food to arrive I looked over at the table next to me to see what the couple had ordered. I instantly had food envy. He had ordered the lamb shank. Memo to self I must order that next time. The lamb fell perfectly off the bone. Anyway, my envy did not last long. 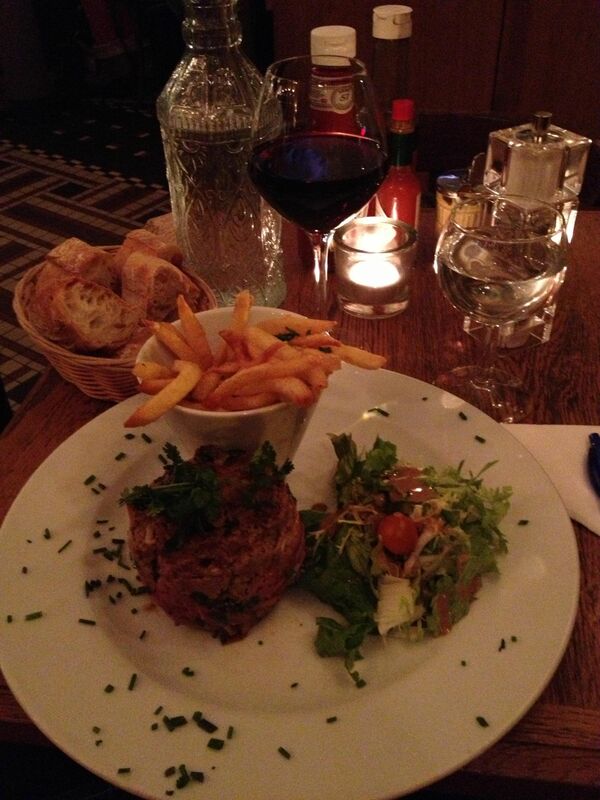 For my tartare and frites arrived and I was not disappointed. In fact I was pleasantly surprised. Rather than the tartare I am so used to of old with an egg, capers, shallots etc. I cut into the tartare and there were beansprouts, carrots and corriander. The steak tartare was definitely done their way with an Asian twist! It was delicious and most unexpected. After my steak tartare, I felt like something sweet but not a whole dessert. Whilst I dithered, I spied the solution on the menu – le cafe guormande. 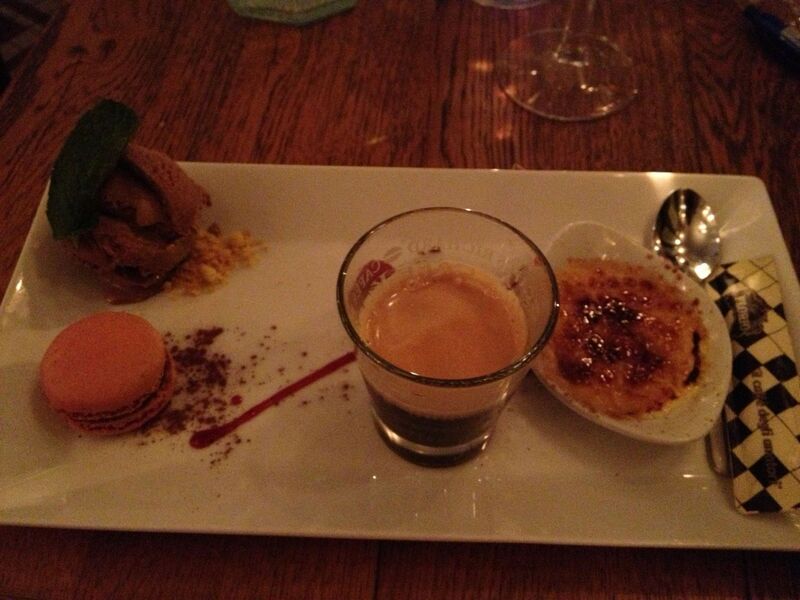 A selection of 3 mini desserts and an expresso. After all variety is the spice of life! This particular cafe guormande consisted of: a raspberry macaron, creme brulee and a scoop of chocolate ice cream with freshly chopped hazlenuts sprinkled on top. It was just what I needed. The brulee was caramelised to perfection and the macaron cracked and then melted on my tongue. Heavenly! I spent 1h30 in the brasserie with no one staring at me. The waitresses did not try to hurry me out but let me marinate during courses and took the time to ask me how my food was. When I first stepped into the brasserie it felt like meeting up with an old friend with a new look. This is definitely a brasserie for the 21st century who is respectful of the old ways. Two courses with wine came to about €27.